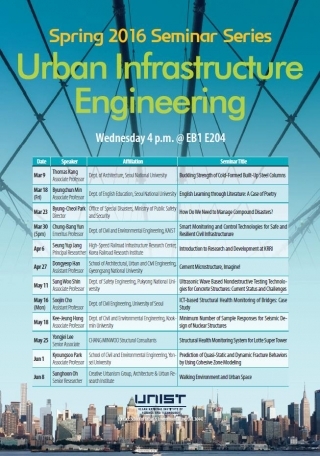 The 2016 Urban Infrastructure Engineering Seminars will be held at UNIST from March 9th to June 8th, 2016. The 6th lecturer of this year’s UIE colloquium is Prof. Sung Woo Shin from Pukyong National University, presenting “Ultrasonic Wave Based Nondestructive Testing Technologies for Concrete Structures: Current Status and Challenges”.